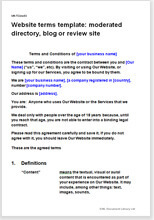 Website terms and conditions template: news, wiki or community site: free-to-access model is suitable where content is primarily contributed by the users of the site and where the site aims to foster an open community. Examples of such sites would be free-to-access forums, wikis and community driven information portals. Like this template, it contains extensive provisions relating to use of content and interaction with the site and other visitors. It differs from the template above only in that it doesn't contain terms relating to on-site subscription for access.